Happy National Hummus Day! Yes, there is such a thing and well there should be because I love hummus. My parents lived in Israel for a few years and they brought back a life-long love of Middle Eastern cuisine. So I grew up with tahini, falafel and massive doses of hummus. And as an adult on my own nothing's changed. My fridge looks a whole lot like theirs did, complete with many tubs of Sabra hummus. 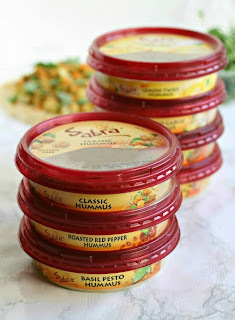 Sabra is actually celebrating this day by giving away coupons so, before we go any further, click on their link to get yours because it's only available today! Now let's talk about this sandwich. It's obviously the open-face kind although you can fold it in half to eat, like a slice of thin NY style pizza. And I've gone a little fusion here because hummus plays well with others. I love curry powder with chickpeas and hummus is made from chick peas therefore hummus goes well with curry powder. Why Sabra doesn't have a curry flavor yet is beyond me. My second favorite thing to mix with curry powder (after the chickpeas) is cauliflower so this was all a natural progression to some new lunch deliciousness. 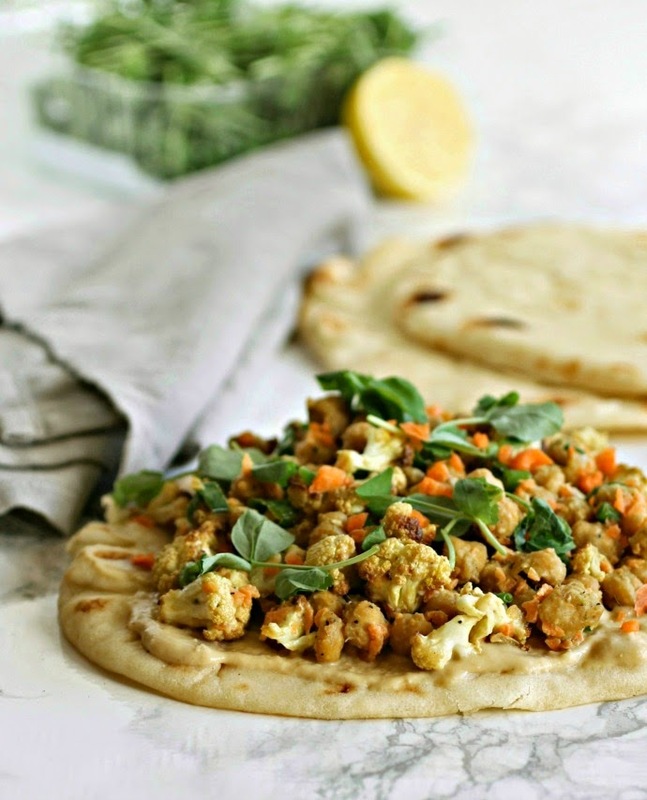 You can serve it on pita bread or naan (more fusion!). I chose naan because I just love it so choose whichever you just love. Enjoy! 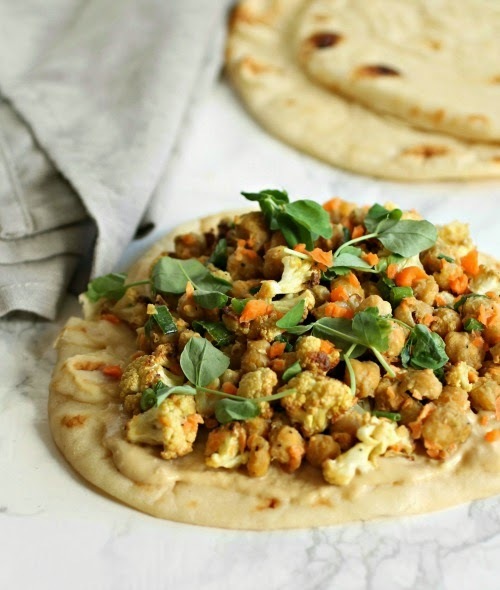 In a large bowl, combine the chickpeas, cauliflower, olive oil and curry powder. Spread them out on a baking sheet lined with parchment paper and roast in the oven for 30 minutes. Combine the hummus and lemon juice. Divide in half and spread one half evenly on each of the 4 slices of naan bread. 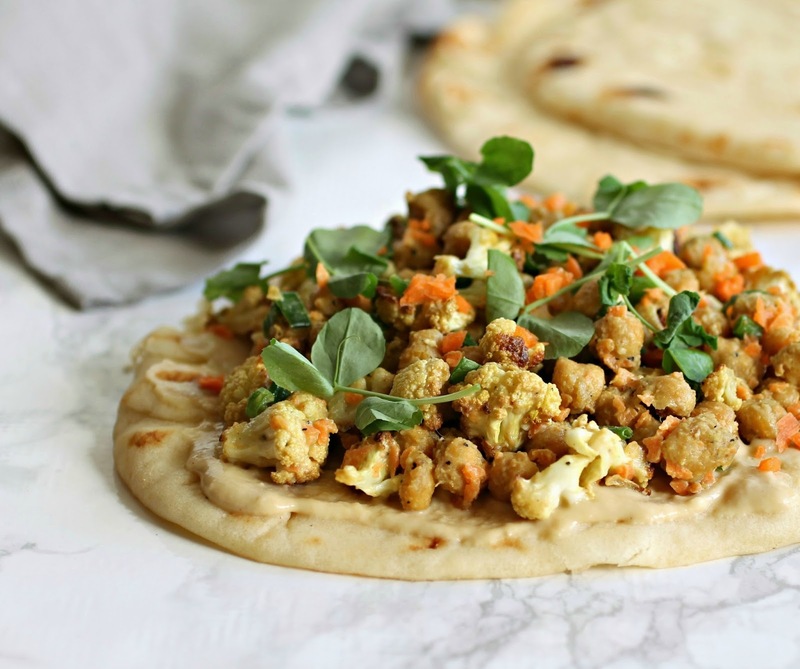 Combine the other half with the roasted chickpeas, cauliflower, carrots and scallions. Season with salt and pepper to taste and spoon onto the bread. Top with greens, if desired. I was compensated for creating this recipe but my opinions are always my own. Thank you for supporting the products I love and use in my kitchen. Clearly I need this recipe in my life. I absolutely adore curry, so I know this is a winner. Pinned. It's funny how Sabra has SOOO many flavors of hummus, but we've still thought of more (curry, buffalo, and maybe za'atar?). Before we know it, they'll have like 100 flavors, and I'd be totally OK with that. Middle Eastern food is the one cuisine I never tire of. I think I could eat it every day! Everything is so fresh and SO flavorful, without just a ton of added fat and salt, you know? I am in love with this recipe - it's sort of the sandwich version of my favorite Curried Cauliflower soup. Yes! Curry and hummus seems like such a natural combination, but I've never thought of it before. This looks like such a great lunch. I could feast on this any day! I could eat Middle Eastern food all day long and be happy. There's so much variety and it's fresh and good for you! I love this sandwich, all those vegetables, hummus and chickpeas make it nice and hearty. Plus the color is outstanding.